I am waking up older today. That happened when I wasn't looking! 33 feels kind of older, like really an adult age. Maybe because Jesus lived to be 33. Isn't that interesting? Jesus died on the cross and rose again when He was 33. Maybe something big will happen this year. 33 is an age where you know who you are, what you want, but you still make mistakes. You're old enough to appreciate good intentions, real love, good food, quality clothing, and not having a car payment. But you're still young enough to buy a pair of boots that you don't technically need, because they're HOT and it's your birthday, and you happen to have a well-exercized justification muscle. A special thank you to my sister, who answered my frantic, "emergency: should I do this?" text message! I had a really great birthday yesterday. It was full of things I love. Actually, I got to open my gifts a couple of days early, because I'm a brat. Michael made me wait to open my card, but he gave me a wonderful bag full of goodies that included an iTunes gift card, the new Maroon 5 CD, an adorable shirt with birds on it (he knows me!) and the cushiest slippers in the world! Before you think I'm an old lady for receiving slippers for a birthday present, and you think he's an old man for giving them to me, remember our floors. They are linoleum tiles on concrete - great for a wheelchair - not so great for someone who has back problems, and walks on a really hard surface all day! The fact that he thought of this, and found the cushiest slippers on the planet and even asked me, "Does it feel like you're walking on carpet?" made me smile. This man is so thoughtful. This is a large, lightweight, super cool, rolls-all-ways Roxy suitcase, people!! 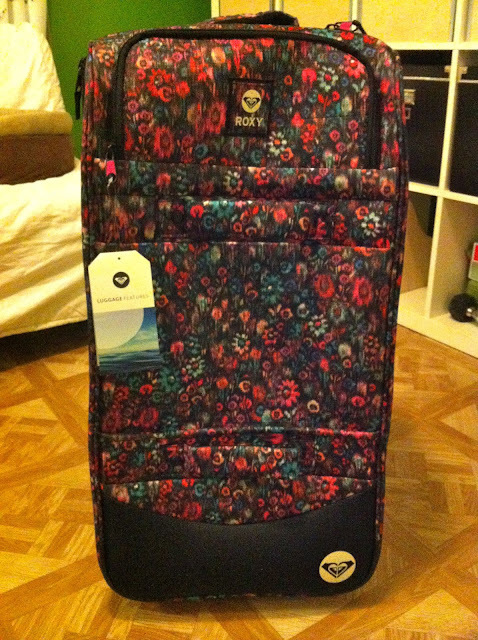 My suitcase is just about dead, and I've been looking for another one, but couldn't find anything I LOVED, and you know - a suitcase is such a commitment, I didn't want to get something I didn't love, and apparently the only luggage I love is Roxy luggage. Because, you know, there are some parts of me that are still 17. This was a big surprise and I love it soooo much. Thank you Mom! I didn't work yesterday. I was going to work from home, but I didn't even do that. I needed a break. Everything and everyone work-related is getting on my nerves. When that happens it means you either need an attitude adjustment, or a break. I had already adjusted my attitude, so I knew I needed a break. 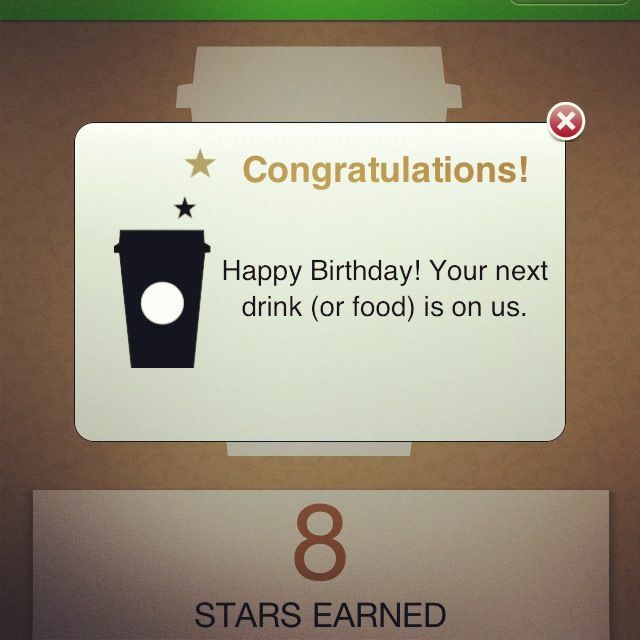 Insert annual free birthday Pumpkin Spice Latte here. And, I was off to Target for a couponing mission! I stocked up on pet food, trash bags, coffee and body wash, and saved like $43.00. I also cashed in a Target Prescription Rewards 5% off card, and the cashier was impressed with my couponing skills, so she gave me an extra $5.00 off AND used a coupon that printed with my receipt to give me $1.25 back in cash. She said it was my lucky day. I told her it was my birthday, and she gave me a hug! Then, I dropped some stuff off at Goodwill, then went through the Burger King drive-thru where the guy informed me that I was their last customer for breakfast. He offered to give me free hash browns, but I declined, because of my current largeness. Then I went to TJ Maxx, and fell in love with those boots! Score again for the birthday girl! When I got home, Michael was just about to head out the door to work. He gave me a kiss, and I opened my birthday card from him. Then, I had the house to myself all day!! That is a gift in and of itself! I continued a cleaning out/organizing project I started last weekend, putting some new bins and drawer organizers in the kitchen, bathed the stinky dogs and changed the slipcovers in the living room. 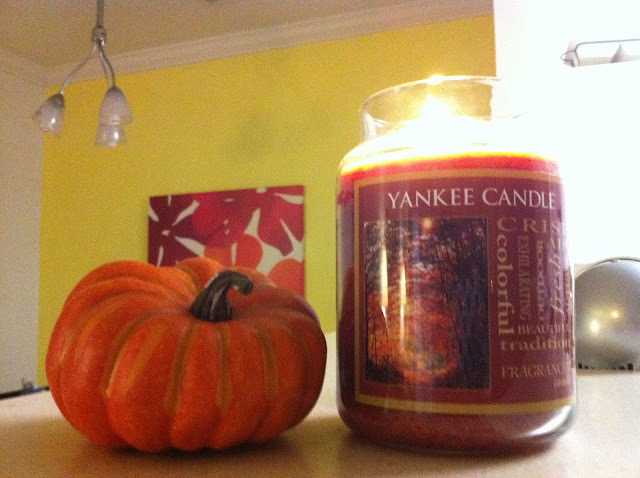 I did all of this to the scent of my new Fall Yankee Candle. The mailman, Carl, came and wished me a Happy Birthday and gave me a package of Bath and Body Works goodness from my in-laws! Score again. 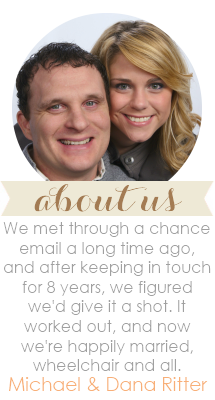 Thanks, Buddy and LaDonna. And a card from my Granny Nora, with a picture of her with her neighbor's dog, and her flowers she planted. She is precious, and I miss her so much, it makes me sick. I hate that she lives all the way in California. I was going to cook dinner in the crockpot - but I got carried away organizing the kitchen cabinets and drawers and my couponing stockpile, so we ended up just eating a bunch of frozen things from Trader Joe's - which is actually a delicious, quick way to do dinner. After we ate, I snuggled up next to Michael in the chair and we watched TV while he massaged my shoulders and I won't go into details, but the entire evening was GREAT. It was a day full of all of the things I love: saving money, freebies, checks in the mail, organizing, puppy time, hubby time, and all done wearing yoga pants. This morning, I'm having my coffee. 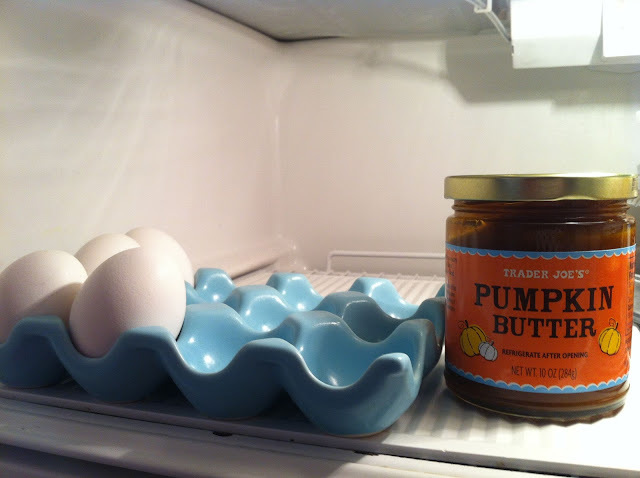 And there is pumpkin butter in my fridge. And in a bit, I'll get Michael up and dressed and we are going to spend the day at a FARM! Yay! We're going to pick pumpkins and apples and maybe get a couple of mums (I'm torn about that - I want to Fallify our porch, but our Summer flowers are still living!) and we're going to take Brokaw! This farm lets you bring your dog, and they can dig up potatoes and peanuts! I hope he finds some. 33 is off to a rock-solid awesome start. Every time I read your post I swear I could be writing many of the same things! 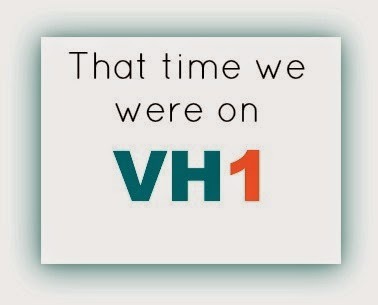 Especially the "I had the l house to myself all day" part"...I love it when that happens. Happy Birthday! Love your prizes and glad you had a great day! !